Establishing a strong credit history is one of the first steps in the home buying process. 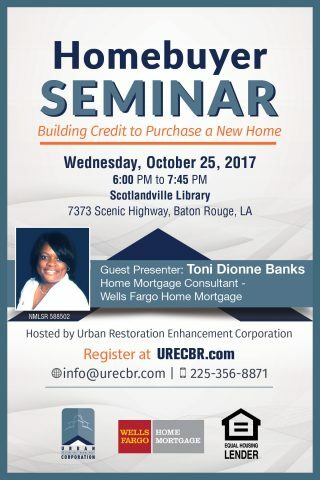 To prepare future homebuyers who desire to purchase a home in the Baton Rouge area, Urban Restoration Enhancement Corporation will host a Homebuyer Seminar on Wednesday, October 25, 2017 from 6:00pm to 7:45pm at Scotlandville Library, 7373 Scenic Highway in Baton Rouge. The seminar will focus on Building Credit to Purchase a New Home. Toni Dionne Banks, Home Mortgage Consultant for Wells Fargo Home Mortgage, will serve as the guest speaker. There is no cost to attend the Homebuyer Seminar. Online pre-registration is required. Please register below or click here. For additional information, contact Sharon Graves at info@urecbr.com or (225) 356-8871. Urban Restoration Enhancement Corporation is a nonprofit community development organization that “transforms communities by investing in people and restoring neighborhoods.” Learn more at www.urecbr.com.